Governments in Australia are moving towards commissioning for outcomes, so it is critical to start aligning your outcomes measurement in preparation. The Australian Social Value Bank (ASVB) supports not-for-profits (NFP’s) across New South Wales (NSW) and Australia in measuring their social impact in a highly rigorous and cost-effective way. We see the need for NFP’s in NSW to strongly align their organisation’s outcomes to the government’s Human Services Outcomes Framework (HSOF) as a fundamental element of their funding and growth strategies. We can align your outcomes framework to the HSOF and the specific outcomes relevant to your funding and growth strategies. If you don’t have an outcomes framework already or it needs updating, we can support your organisation to develop or refine your outcome framework. Read our detailed alignment paper “Aligning the Australian Social Value Bank to NSW Human Services Outcomes Framework”, which maps the ASVB outcomes to the NSW HSOF framework. It provides practical advice on how to apply the ASVB as a complete solution to proving your impact and providing social value statements to your funders. What is the NSW Human Services Outcomes Framework? New South Wales (NSW) is leading the way in the use of an outcomes-based approach. NSW has developed an over-arching Human Services Outcomes Framework (HSOF). The HSOF has seven domains which are Social & Community, Education & Skills, Empowerment, Economic, Safety, Health and Home. An outcomes indicator library has been published and provides population level indicators for the outcome domains in the HSOF. The embedding of outcomes into service contracts is currently underway in housing and targeted early intervention, with homelessness being the next service area to have contracts aligned with this new approach. 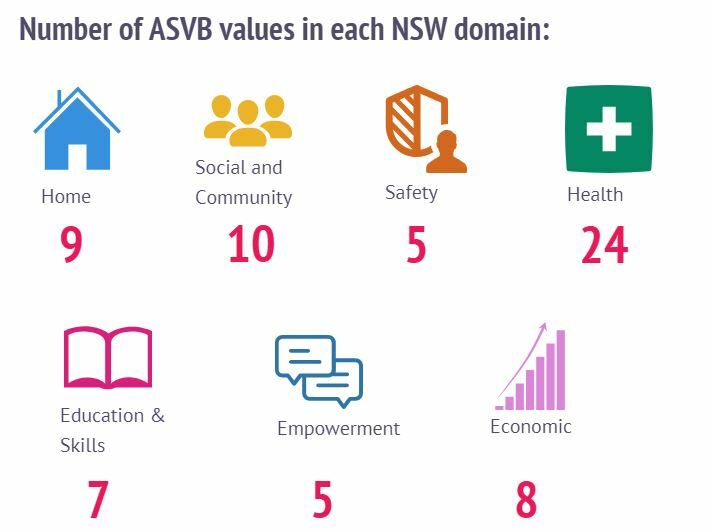 The ASVB values closely align to the NSW Human Services Outcomes Framework. There is a differentiation in the domains we have used to segment our outcomes list, however the underlying outcome indicators in the majority exist within the ASVB. Why should my organisation be aligning our outcomes to the NSW framework? These outcomes frameworks are slowly being embedded into service contracts, making measurement and reporting on outcomes a condition of receiving funding. In the future, it is highly likely that any organisation who is unable to measure outcomes will find it hard to meet government selection criteria for contracts or funding. Read our detailed NSW alignment paper here. How does the ASVB support my organisation to align with the WACOSS Outcomes Framework? The Australian Social Value Bank (ASVB) supports not-for-profits (NFP’s) across Western Australia and Australia in measuring their social impact in a highly rigorous and cost-effective way. We see the need for NFP’s in WA to strongly align their organisation’s outcomes to the government’s outcomes framework as a fundamental element of their funding and growth strategies. We can align your outcomes framework to the Western Australian Council of Social Service’s (WACOSS) draft framework and the specific outcomes relevant to your funding and growth strategies. If you don’t have an outcomes framework already or it needs updating, we can support your organisation to develop or refine your outcome framework. Read our detailed alignment paper “Aligning the Australian Social Value Bank to WACOSS Outcomes Framework”, which maps the ASVB outcomes to the WACOSS framework. It provides practical advice on how to apply the ASVB as a complete solution to proving your impact and providing social value statements to your funders. 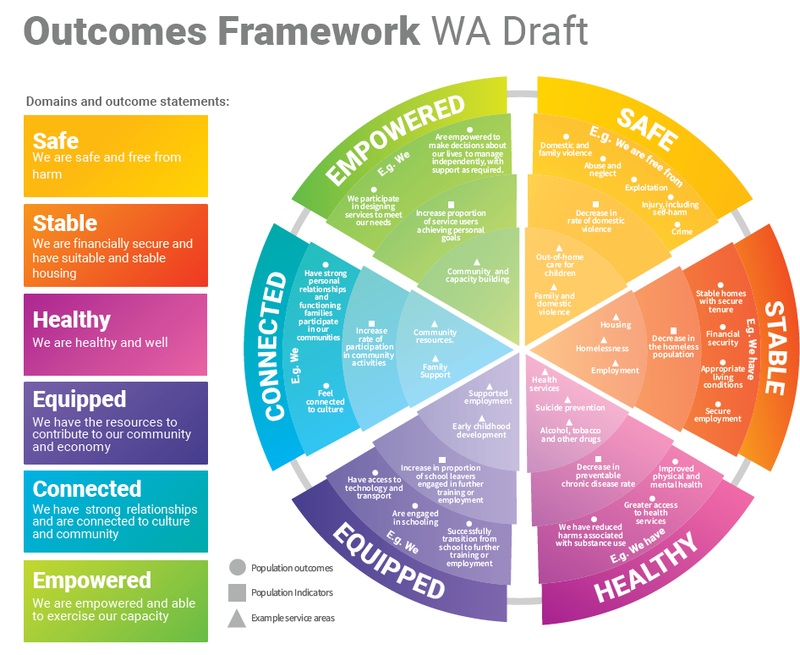 What is the WACOSS Outcomes Framework? The Western Australian government has commissioned the Western Australian Council of Social Service (WACOSS) to lead the development of their outcome’s framework. The project is sponsored by the Department of Premier and Cabinet. The project currently has a draft framework and is carrying out consultation with the social sector. They aim to publish an agreed framework in June 2019. The draft outcomes framework has six domains which are Safe, Stable, Healthy, Equipped, Connected and Empowered. It is highly encouraging to see that the project is being driven by the Department of Premier and Cabinet and that the working group has representatives spanning all major Government departments. The ASVB values closely align with the WACOSS Outcomes Framework. There is a differentiation in the domains we have used to segment our outcomes list, however, the underlying outcome indicators in the majority exist within the ASVB. Why should my organisation be aligning our outcomes to the WACOSS framework? Read our detailed WA alignment paper here. HOW DOES THE ASVB SUPPORT MY ORGANISATION TO ALIGN TO THE VIC PUBLIC HEALTH OUTCOMES FRAMEWORK? The Australian Social Value Bank (ASVB) supports not-for-profits (NFP’s) across Victoria and Australia in measuring their social impact in a highly rigorous and cost-effective way. We see the need for NFP’s in Victoria to strongly align their organisation’s outcomes to the government’s outcomes framework as a fundamental element of their funding and growth strategies. We can align your outcomes framework to the Victorian Public Health framework and the specific outcomes relevant to your funding and growth strategies. If you don’t have an outcomes framework already or it needs updating, we can support your organisation to develop or refine your outcomes framework. Read our detailed alignment paper “Aligning the Australian Social Value Bank to Victoria Public Health Outcomes Framework”, which maps the ASVB outcomes to the Victorian framework. It provides practical advice on how to apply the ASVB as a complete solution to proving your impact and providing social value statements to your funders. WHAT IS THE VICTORIAN PUBLIC HEALTH OUTCOMES FRAMEWORK? 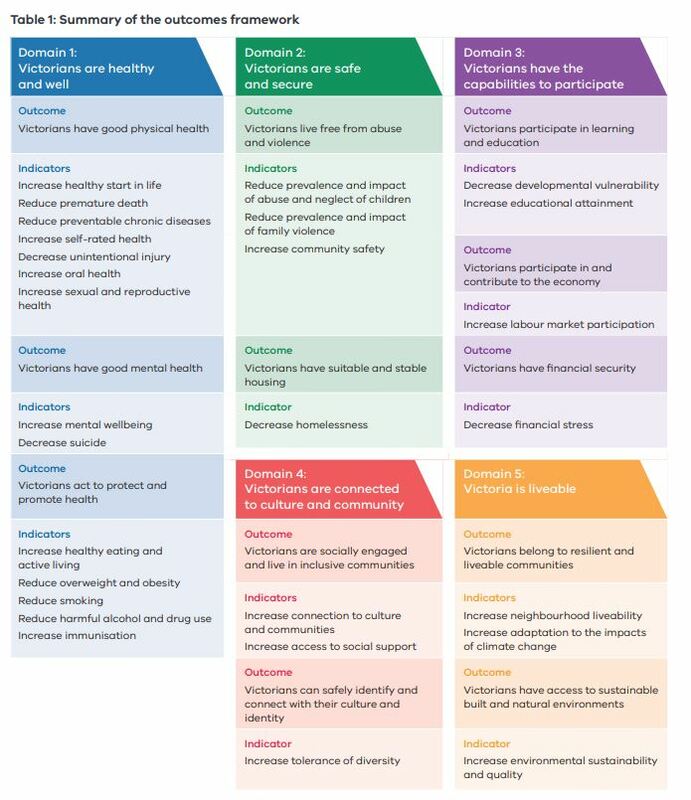 The Victorian government outcomes framework forms part of the Department of Health and Human Services strategic plan. There is clear evidence that it has been embedded internally and they are reporting on their performance against the outcome areas. The Victorian Public Health and Wellbeing Outcomes Framework add an additional domain of “Victoria is Liveable” to the Department’s higher-level strategic plan version. The Victorian framework has five domains which are Victorians are healthy and well, Victorians are safe and secure, Victorians have the capabilities to participate, Victorians are connected to culture and community, Victoria is liveable. A data dictionary has been published which has over 30 data sources which are identified to monitor health and wellbeing outcomes for all Victorians and to assess inequalities for specific populations and locations. This data dictionary provides detailed technical specifications for every measure identified in the outcome’s framework. We were unable to identify or find evidence that these outcomes are being used, or considered, for embedding outcomes into service contracts and funding requirements at this stage. WHY SHOULD MY ORGANISATION BE ALIGNING OUR OUTCOMES TO THE VICTORIAN FRAMEWORK? Read our detailed Victorian alignment paper here. Making social impact measurement accessible and achievable for everyone. ASVB - making it count! Would you like to talk to one of our experts about what the ASVB can do for you? Alliance Social Enterprises brings you Australia's First Social Value Bank. We're working to improve the 'quality of life' of individuals and communities in Australia by making social impact measurement accessible, affordable and simple-to-do; supporting the allocation of scarce resources to where they can have the greatest impact. The Australian Social Value Bank - making it count! Simetrica specialises in cutting-edge research on social impact analysis and policy evaluation. Their leading team of academics and social scientists have ensured the highest level of scientific rigour supports the values and methodologies used within the Australian Social Value Bank.